2018 Horex VR6 Classic HL. Picture credits - Horex. Submit more pictures. In line with their historic role model, the special HL models feature a chrome look and the colours red and black, while the rims also have red colour applications. The new HOREX VR6 HL models also stand out thanks to the values and characteristics familiar from the series as a whole: CFK light-weight technology, select high-end components, exclusive materials and outstanding manufacturing quality. Price as new (MSRP): Euro 42500. Prices depend on country, taxes, accessories, etc. Engine details: VR6 with only 15 degree V-angle mirrored cylinder offset. Triple overhead cam. Clutch: Multi-disc oil bath clutch, operated hydraulically. 1:2.47 ratio. Front brakes: Double disc. Bosch ABS. Brembo radial 4-piston calipers. Alternate seat height: 840 mm (33.1 inches) If adjustable, highest setting. Comments: HL is short for Heritage Line. German brand. Ask questions Join the 18 Horex VR6 Classic HL discussion group or the general Horex discussion group. Bikez.biz has an efficient motorcycle classifieds. Ads are free. Click here to sell a used 2018 Horex VR6 Classic HL or advertise any other MC for sale. 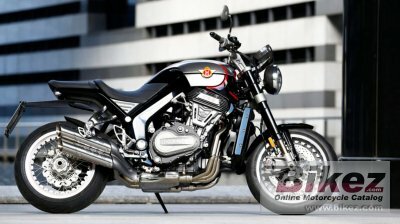 You can list all 2018 Horex VR6 Classic HL available and also sign up for e-mail notification when such bikes are advertised in the future. Bikez has a high number of users looking for used bikes. Before you buy this bike, you should view the list of related motorbikes Compare technical specs. Look at photos. And check out the rating of the bike's engine performance, repair costs, etc.